Dansko is firmly rooted in providing high quality, comfortable, innovative products along with exemplary customer service. Established in 1990, Dansko has been a leader in providing all day comfort footwear, socks and healthcare apparel while standing at the forefront of ethical business practices. Dansko recently unveiled its fall collection full of fashion forward, luxurious styles that deliver the brand’s promise of superior comfort and support. The collection is a fresh twist on Dansko’s iconic clog, and you’ll notice a variety of styles, from flats to boots. Softer leathers with burnished metallic tones, buttery soft sheep nappa and kid suedes add a luxurious touch to the fall 2012 collections. With each new style you’ll find attention to detail that makes each shoe truly special. These shoes will not only be your most comfortable, they will be your favorites. The Crepe Boot in Steel Vintage Suede were definitely my favorite from the Fall Collection! Natural suede and rustic details like exposed rivets and seams give unexpected flair to our tall crepe boot. Goring at the calf and a full zip closure make it easy to slip on and go. 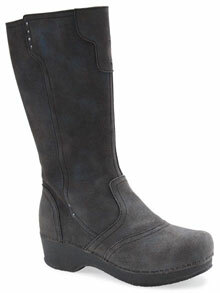 I love that I can now be comfortable and look fashionable with these Crepe Boots from Dansko! Buy It: You can purchase the Crepe Boot in Steel Vintage Suede for a MSRP of $210 at a local retailer near you or online retailer.